“>The Florida Gourd Festival is now over and I placed in three categories. 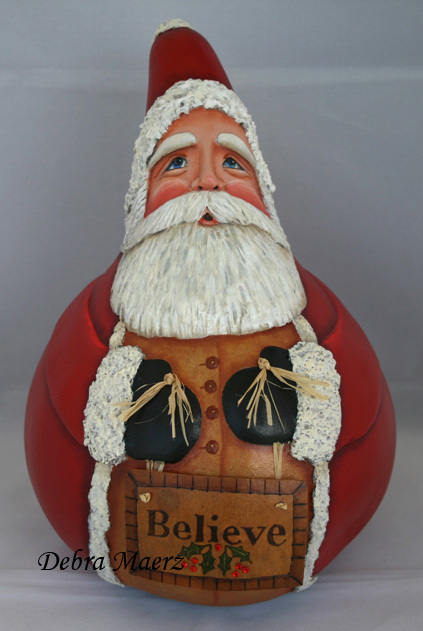 The Santa Gourd I sculpted paper clay to add dimension for for the face, beard, arms gloves and fur. The “Believe” message he is carrying is also part of a gourd that I cut and then wood burned the word Believe. 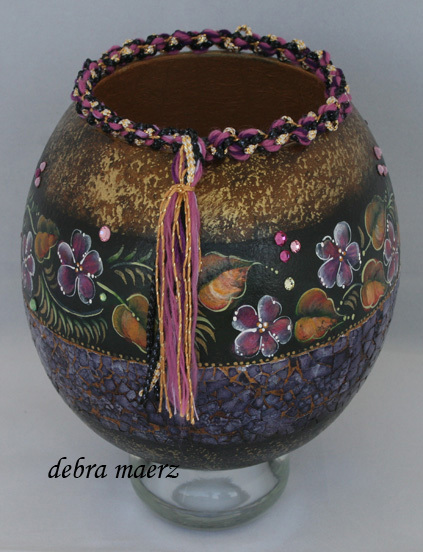 I added some bling with crystals and some raffia. I thought he turned out pretty good, but only a third place ribbon this year. I also placed third for a Santa necklace that I made, which I decided to enter at the last minute. No photo on that one. 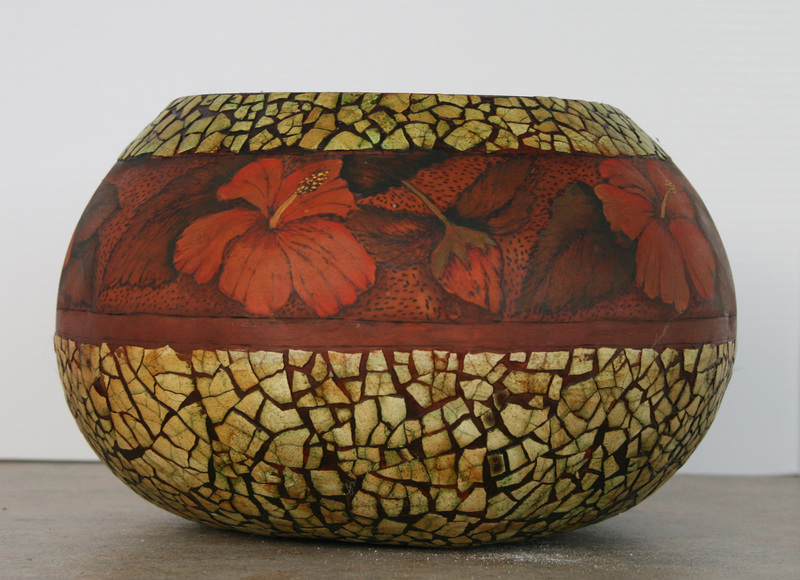 The eggshell mosaic bowl in one of my previous posts received a “merit” ribbon but had lots of positive reviews from the public and other gourd artists. Of course I did not mind sharing the technique, it is very easy to do, just requires lots of patience. Here are the photos of a few of my entries . This is a mini-gourd – no higher than three inches! 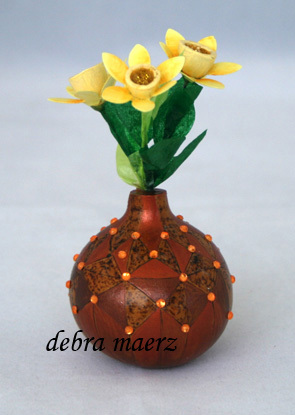 The flowers were also created with tiny gourd tops. That is all for now – have a wonderful day . . thanks for stopping by my site and if you are so inclined leave me a comment! 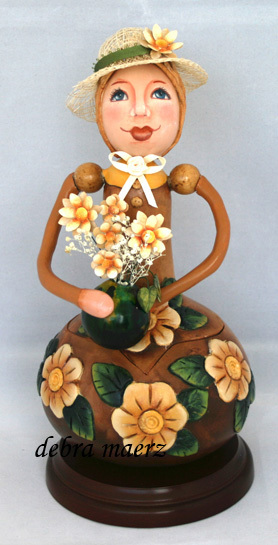 This entry was posted in Gourds, News and tagged Gourd, Gourd Dolls, Gourds, Santa Gourd by Debra Maerz. Bookmark the permalink.